This course will focus on the endangered wildlife of East Africa. Students will have opportunities to explore a variety of rich and distinctive ecosystems, such as jungles, tropical rainforests, tea plantations, savannas, and marine habitats. In particular, we will study the efforts to save the elephant from extinction due to poaching. In Uganda we will visit Murchison Falls National Park on the border with the Congo, where we will go on a Chimpanzee trek. On our way to Kenya we will camp on the banks of the Nile where we will spend a day rafting and relaxing. From Uganda we will travel through Kenya visiting one of the greatest wildlife habitats in the world, Maasi Mara National Park, go biking through Hell's Gate National Park, and finally camp at Amboseli National Park at the base of Mt. Kilimanjaro. We then enter Tanzania where we we will travel to Dar es Salaam and then finish our trip with a visit to the ancient and historical spice island of Zanzibar in the Indian Ocean where we will also enjoy the white sand beaches of Zanzibar and snorkel on the Indian Ocean coral reef. To add to the cultural flavor of the course, students will have the opportunity to visit the capitals of Tanzania and Uganda, Dar es Salaam and Kampala, and to interact with the local population in a variety of environments. These will include a visit to African Hearts Orphanage, a Massai tribal village, Ndere Cultural Center, and interaction with our African guides on a daily basis. 1. Immunizations will be required. 2. A major portion of this trip will be tent camping. This means sleeping in tents on the ground, very primitive toilets (holes in the ground at times), doing your laundry by hand, and cold showers, if they are available. If you sign up for this trip, please be prepared to rough it!! Arrival – Pick up at the airport and transfer to Kampala, check in to hotel, Namirembe Guest House. Daytrip to city for lunch, shopping at Craft Market, ice cream at Specke Hotel. Overnight at Namirembe Guest House. Travel to Murchison Falls National Park. Overnight camping at MFNP. 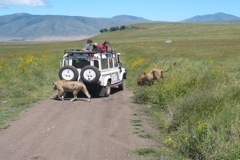 From our camp in the MFNP, we explore the park by vehicle. We will visit the top of Murchison Falls and will also take the boat up-river to the bottom of the falls. On the second day we will track chimpanzee in the Budongo Forrest Reserve. Leave the Murchison Falls after breakfast and drive back to Kampala with picnic lunch. Stop at Ziwa Rhino Sanctuary. Dinner at Ndere Cultural Center. Overnight at Namirembe Guest House. Rafting on the Nile with ADRIFT – ½ day trip. Spend night camping at Adrift camp. Morning and afternoon game drives in the park. Camping in Masai Mara national park. Morning game drive in the park. Afternoon travel to Hells Canyon national park. Visit to local village. Game drives and mountain biking through park. Visit Arusha, then travel to Marangu at the base of Mt. Kilimanjaro. Catch the bus from Arusha to Dar es Salaam in early morning. Accommodations at Econolodge. Transfer to the Zanzibar Ferry to take early morning ferry to Zanzibar. Tour Stone Town. Shopping. Lunch. After lunch leave for accommodations in northern Zanzibar. Overnight at Sunset Bungalows. Snorkeling in the Indian Ocean. Overnight at Sunset Bungalows. Return late afternoon via the ferry to Dar es Salaam. Dinner and overnight at the Econolodge.